Gold prices jumped to the highest levels of the session on Tuesday, as weaker-than-forecast U.S. jobs data dampened expectations that the Federal Reserve will start to taper its bond-buying program in the coming months. On the Comex division of the New York Mercantile Exchange, gold futures for December delivery traded at $1,332 an ounce during U.S. morning trade, up 1.2%. 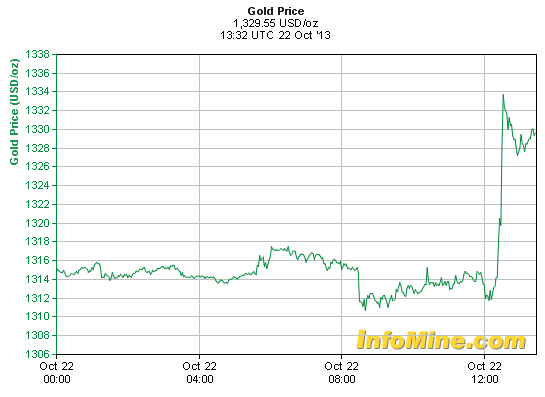 Prices hit a session high of $1,334.90 an ounce, the strongest price reached this month. The U.S. Department of Labor said the country added 148,000 jobs in September, below analyst expectations of 180,000 jobs, in the first clear reading on the health of the world’s largest economy since a government shutdown halted data releases for three weeks. The figure, experts believe, suggests only modest momentum in the U.S. economy, but the unemployment rate dropped again to 7.2%.